It’s your birthday and you get lots of birthday wishes and greeting on Facebook. 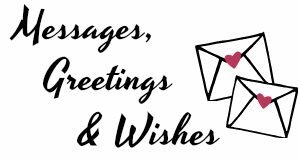 Though it’s really an amazing feeling that you are the center of attraction for the day and you get so many good wishes, but at times it’s almost impossible to revert to each and every one who posted on your Facebook wall or sent you a direct message. It is always a good idea to posted a common status on Facebook thanking everyone who wished you. And now, if you are looking for thank you message for birthday wishes on Facebook, you are at the right place. We have the most unique and best thank you message for birthday wishes On Facebook. So without further ado, here you go! • You all made my birthday a memorable one by sending your loved wishes to me. Thank you so much! • I am truly grateful to each one of you for your warm and loved birthday wishes. 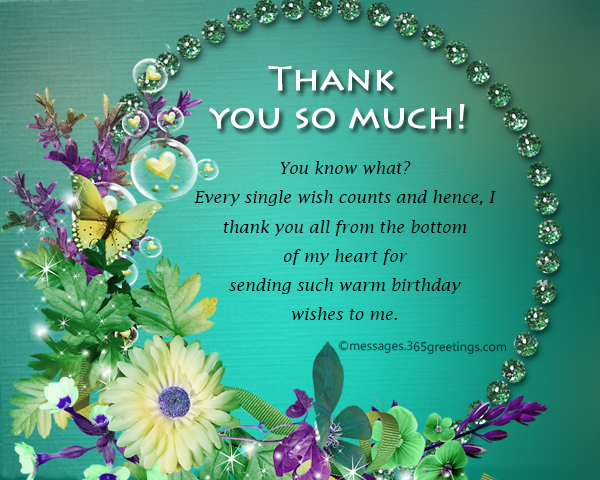 • Thank you for making my birthday even more special by sending loved wishes to me. • I am not able to acknowledge each and every wish that you sent here on Facebook but trust me, I have read it all and I am truly grateful each and every one of you for the same. 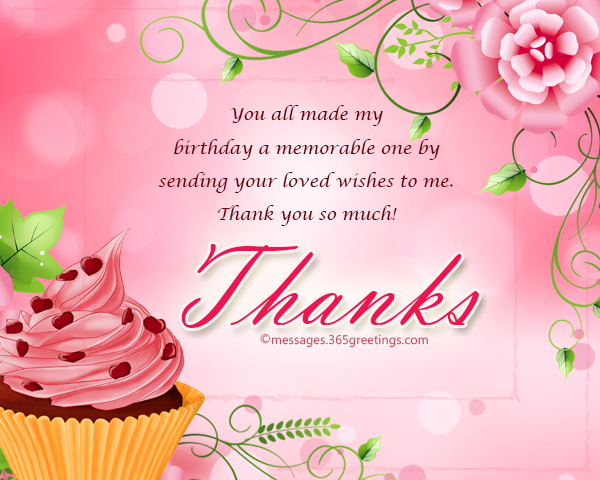 • Kindly accept my sincere gratitude in return to your amazing and joyful birthday wishes. You all simply made my birthday a happier one. 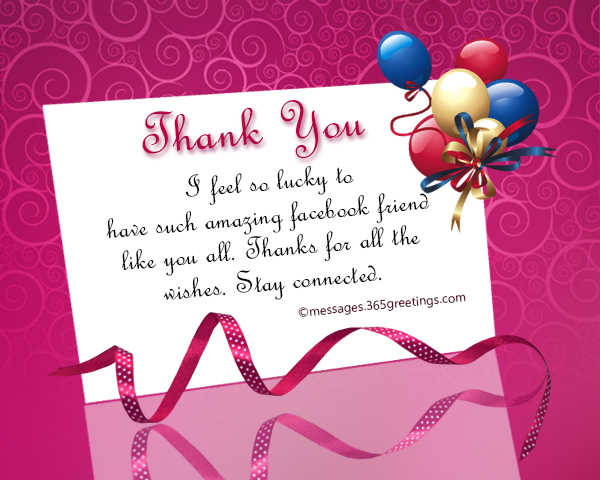 • I feel so grateful that I have so many friends here on Facebook who care to wish me on my birthday. Thanks a lot for your loved wishes. • So many birthday wishes! I didn’t know that I am so much loved. Thank you all so much. My Facebook friends are the best ones. • I never expected but you all showered so much love upon me on my birthday. Thank you so much for your wishes. I am truly grateful. • Thank you for your wonderful birthday wished and thank you for making me feel loved. This birthday was the best so far! • Your wishes made my birthday even brighter. I am running short of words to express my gratitude to you. So, simply want to say thank you from the bottom of my heart. Love you all! • A huge shout-out of gratitude for each one of you who took out time to wish me on my birthday! Thank you so much. You people are the best! • I have begun to love Facebook even more. You know why? Because of you all, as you showered the best of birthday wishes upon me making Facebook my favourite place to be! Thank you so much. 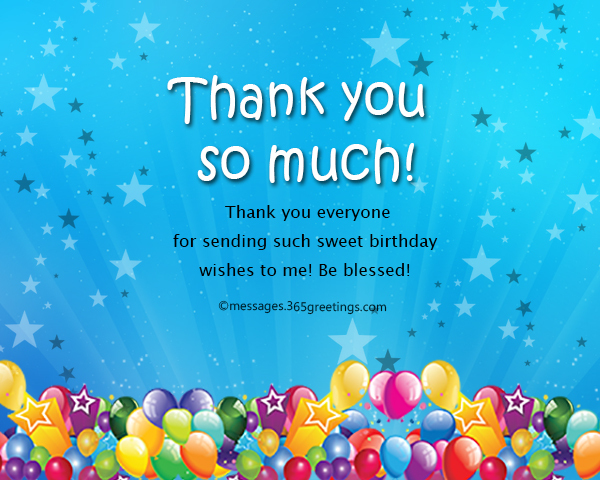 • Thank you everyone for taking out time from your busy schedule and wishing me on my birthday! I am truly grateful for each and every single wish I received today. • You know what? Every single wish counts and hence, I thank you all from the bottom of my heart for sending such warm birthday wishes to me. • For me, wishes are more valuable than expensive gifts. I feel richer upon receiving so many birthday wishes from you all here on facebook. Thank you so much! • Birthdays are super fun, especially when one gets so many loved birthday wishes from lovely people like I got on my birthday from you all. Thank you everyone! • Hey everyone! I couldn’t respond to each and every wish but trust me, I am truly thankful to everyone for your wishes. I shall connect with everyone soon! But for now, it’s party time! Thank you and take care! 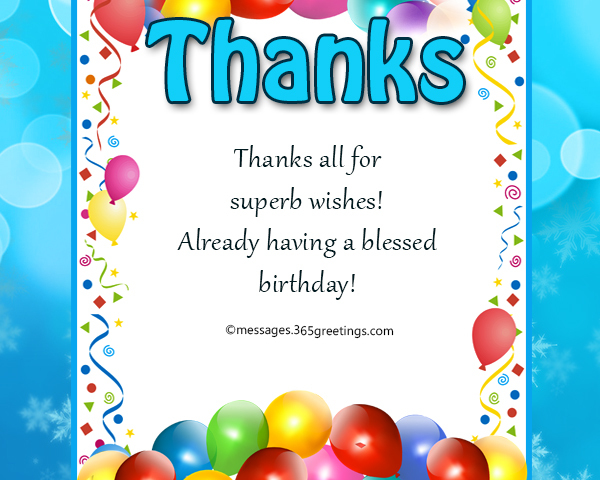 • I am not a tech savvy person and therefore, I just came online to thank you all for your lovely birthday wishes. You made my day! • I am not a regular on Facebook and therefore, it was no less than a surprise to get so many birthday wishes here. I thank you all for wishing me on my birthday! Means a lot. • Here’s me the birthday girl/boy taking a moment to say THANK YOU SO MUCH for all your loved birthday wishes. Means world to me! Thank you! • On this special day of mine, thank you for sending me your birthday wishes and reminding me that I am loved. I thank God for surrounding me with such lovely people as you all are! Thank you everyone. • Each and every wish means a lot to me. I am truly grateful that I am surrounded with such nice people like you all. Thank you so much. You made my birthday a happier one! • I am not a party person neither I like celebrating birthdays. But I truly loved reading all your birthday wishes and messages here on facebook and trust me, it was no less than a treat for me. Thank you so much everyone! • Your birthday wishes are the most expensive gifts that I’ve ever got. Thank you so much people! Stay blessed. • I pray to God to bless each and every single person who wished me on my birthday! Thank you so much. 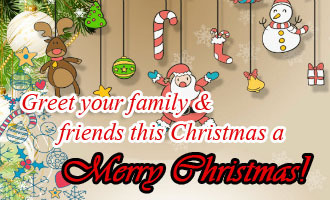 • I might have thousands on friends here on my facebook friend-list and you might think that I didn’t notice your wish, but you are wrong. I read each and every wish and I thank you all for that. 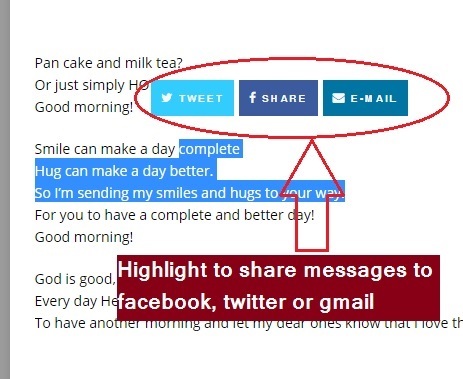 • No long status updates or memes to tag you. I simply want to say Thank You for all the loved birthday wishes. I wish truckloads of happiness to you too! • I am truly overwhelmed on receiving such wonderful and amazing birthday from you all. You made Facebook my favourite place to be on my birthday! Thank you so much. • Thank you each one of you for your kind greetings, messages and meme tags on my birthday! Every little joyous gesture means a lot to me! • Getting too much of attention always makes me feel uncomfortable but this shower of birthday wishes on my Facebook definitely made me feel on top of the world. Thanks all! • Thank you everyone for sending such sweet birthday wishes to me! Be blessed! • I thank to everyone who sent beautiful birthday messages, poems, quotes and meme to me on my birthday, and also to those who simple wrote HBD on my wall. Know that every single wish matters to me! Rock on! • I thank to those who sent birthday wishes to me today, and also to those who forgot to wish me; and yes, to those too who saw that it’s my birthday today and willingly chose to ignore. It’s all cool here! Be happy everyone! • I am ready to rock another year of my life. 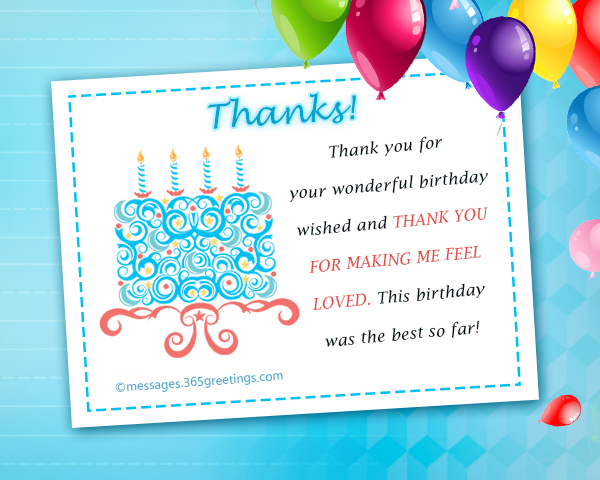 Thank you making it a great start by sending amazing wishes to me! I love you all. • This status is to let you know that I am thankful for all your wishes! This is the best birthday ever! • First thank goes to God and my parents for everything in my life today and then, another set of thanks goes to you for your love-filled birthday wishes! You all made my day! • Over 3000 birthday wishes! I couldn’t have asked for me. Thank you everyone. Ya’ll the best! • I had a great day today. My family and friend threw a surprise birthday party and got lots of gifts. Just when I thought the party is over and we are done with all the celebrations, I logged in here and now, I am dancing with joy again upon reading your birthday wishes. Thank you everyone. You people rock! • You know what’s my favourite part of my entire birth day? Sitting in a cozy couch, sipping tea/coffee, listening to my favourite music and reading your birthday wishes and messages. Thank you all! I feel blessed to have you all in my life. • Thanks all for superb wishes! Already having a blessed birthday! • I totally loved how much phone kept on beeping with facebook notifications because of you all and your wishes. This is the best kind of disturbance one can ever get. Love you all. Thank you! • I didn’t know there is a virtual party going on here on facebook on my wall. Your birthday wishes and messages are making me go gaga! Thank you so much. • I love my birthday because that’s one day of year when I realize how much I am loved. Thank you so much everyone! This was the best birthday E-V-E-R! • I still can’t get over the fact that I got over 4000 birthday wishes here on facebook. I am feeling like the king/queen of the world. Love you all. Thank you! • Woah! Never thought I’d get so many wishes here on facebook, else I would have come online a bit earlier. But better late than never. Thank you all for your amazing wishes. I am literally dancing with joy right now! • I am aware of the fact that I am terrible with facebook but trust me, seeing your wishes makes me feel the happiest and at this very moment, I’d like to thank you all from the bottom of my heart for being so selfless and generous! 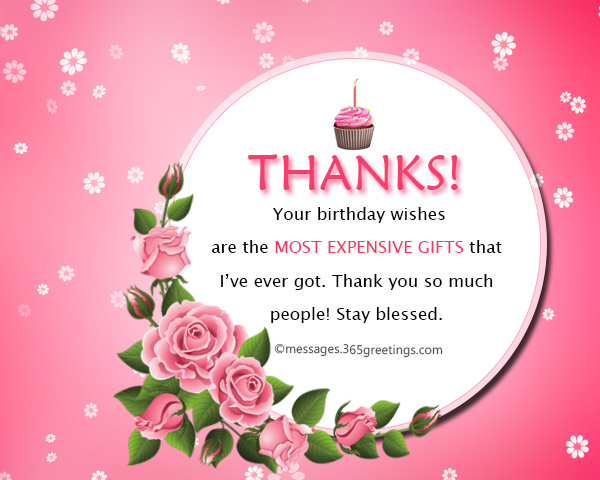 • Please accept my sincere apologies for not responding to your messages and wishes (blame the internet connection for that) and also accept my humble gratitude for being so generous and sending your wishes to me on my birthday. I will get in touch with you all real soon. Thank you! • Waking up to so many birthday wishes and messages! Couldn’t be a better start for a day. Already loving it. Keep your love coming in! • I feel so lucky to have such amazing facebook friend like you all. Thanks for all the wishes. Stay connected. • If I’d have super powers, I would have come to your place to personally thank you for your amazing wishes on my birthday. But for now, please accept my thank you and give a smile in return! • Your wishes added an extra charm to my birthday celebration. Thanks all! Stay blessed. • Reading your wishes just doubled the joy of celebrating my birthday. Thanks all! • It feels wonderful to be loved by amazing people like you. I feel lucky! Thank you for your loving and joyous wishes. • A huge thank you for every single person who wished me today. Your simple wish means a lot to me. May almighty bless you all and may you be the happiest. • Reading your wishes is also a part of my birthday ritual and like every year, this year too you all made it a special one by showering truckloads wishes upon me. Thank you everyone. Love you! • Thanks all for love, support and beautiful birthday greetings. I have got the best facebook family ever!